• Sanskriti Foundation was established and blessed by Acharya Shri Vidyanandji Maharaj, in the presence of Dr. L.M. Singhvi and other eminent people. • First activity of the Foundation – the creation of the Sanskriti Awards. 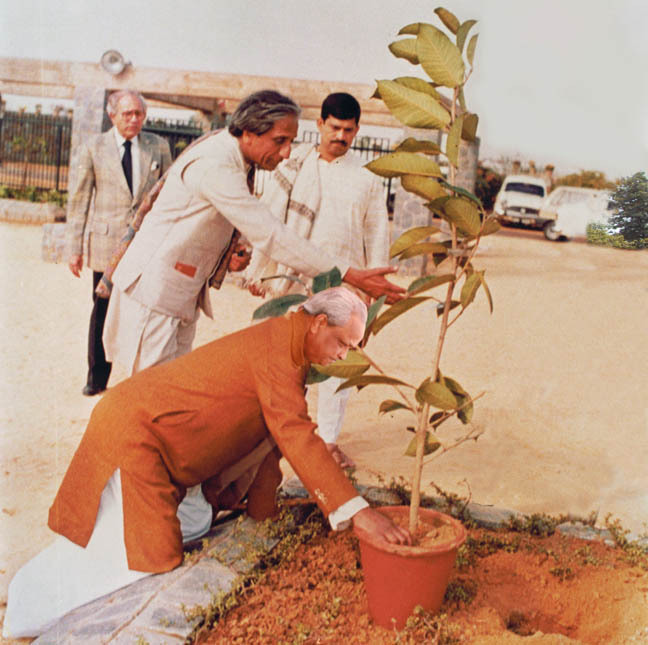 Shri Morarji Desai, Prime Minister of India, presented the first awards. • About 5 acres of land were acquired to set up a cultural centre and campus. • The Museum of Everyday Art was established at Shri O.P. Jain’s residence, C6/53 Safdarjang Development Area and was inaugurated by Smt. Pupul Jayakar in the presence of Dr. Mulk Raj Anand and Shri Jagmohan. • Publication of Everyday Art of India, a catalogue on the collection of the Museum. • Allotment of land at C-11 Qutab Institutional Area by the Delhi Development Authority (DDA). • Ground-breaking ceremony of Sanskriti Kendra and planting of a Banyan tree by Kumar Gandharva and other friends of Sanskriti followed by a concert. 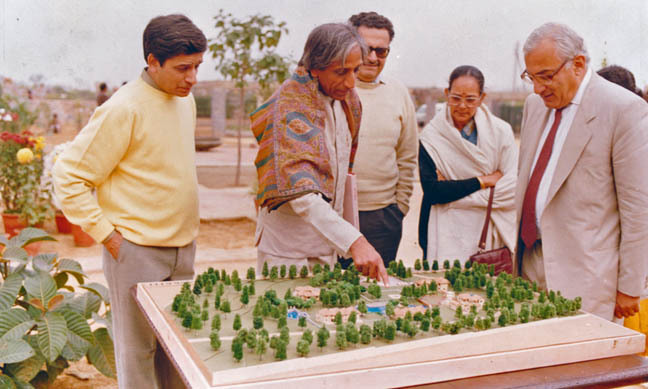 • Architecture and landscape planning of Sanskriti Kendra was undertaken and construction of buildings started. • Completion of Sanskriti Kendra. • Establishment of the Sanskriti Museum of Indian Terracotta along with a workshop on Terracotta by eminent artists such as Bhupen Khakhar and Gulam Muhammad Sheikh, as well as local craftsmen like Neelamani Devi, Khemraj Kumar, etc. • Commencement of the first Residency Programme for artists and writers. • The Museum of Everyday Art shifted to Sanskriti Kendra. • The Sanskriti Institute of Management (SIM) initiative is launched, together with the publication of a nine-volume report on Management of Cultural Institutions in India. • Completion of building at C-11, Qutab Institutional Area. • Endowment challenge grant of Rs. 1.25 crores by the Ford Foundation. • Celebration of 25 years of Sanskriti Foundation with a seminar on Corporate Cultural Responsibility and the publication of Sanskriti, a Handbook, in celebration of 25 years of the Foundation. • Sanskriti Fellowships instituted for young and creative minds. • A Ceramic Centre set up in collaboration with the Delhi Blue Pottery Trust . • Establishment of the Museum of Indian Textiles. • Publication of Museum of Indian Textiles, a catalogue of the collection of the Museum. • Setting up of an Enamel Centre in collaboration with the Enamellist Society. • Construction of a Multi-Purpose Hall and relocation of the Ceramic Centre. • Setting up of a Block Printing Unit.